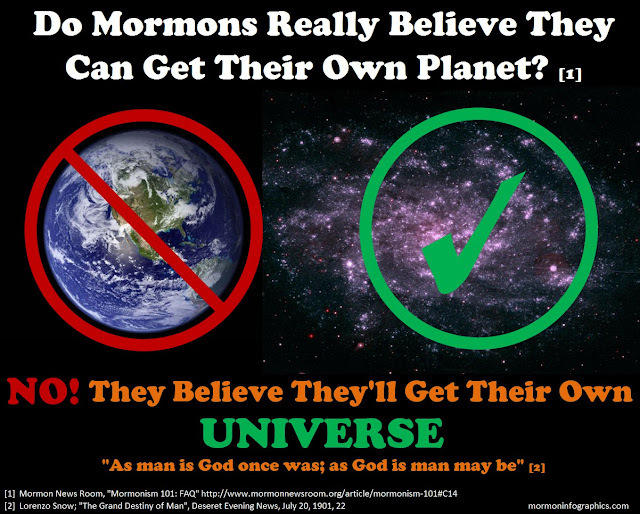 Mormon Infographics: Do Mormons Really Believe They Can Get Their Own Planet? Do Mormons Really Believe They Can Get Their Own Planet? Q: Do Mormons really believe they can get their own planet? A: No! They believe they'll get their own universe. "As man is God once was; as God is man may be"
 Mormon News Room, "Mormonism 101: FAQ"
No. This idea is not taught in Latter-day Saint scripture, nor is it a doctrine of the Church. 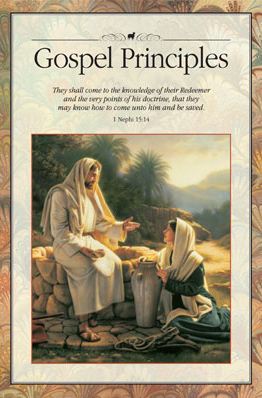 They will live eternally in the presence of Heavenly Father and JesusChrist (see D&C 76:62). They will become gods (see D&C 132:20–23). They will be united eternally with their righteous family members and will be able to have eternal increase. They will receive a fulness of joy. They will have everything that our Heavenly Father and Jesus Christ have—all power, glory, dominion, and knowledge (see D&C 132:19–20). President Joseph Fielding Smith wrote: “The Father has promised through the Son that all that he has shall be given to those who are obedient to His commandments. They shall increase in knowledge, wisdom, and power, going from grace to grace, until the fulness of the perfect day shall burst upon them” (Doctrines of Salvation, comp. Bruce R. McConkie, 3 vols. [1954–56], 2:36; italics in original). Finally something that Mormons really believe! Great scriptural references! But I think we could add at least one more as recorded by the apostle John (10:34-36), quoting Jesus: “Jesus answered them, Is it not written in your law, I said, Ye are gods? If he called them gods, unto whom the word of God came, and the scripture cannot be broken; Say ye of him, whom the Father hath sanctified, and sent into the world, Thou blasphemest; because I said, I am the Son of God.” Jesus was partly quoting from the Old Testament (Psalms 82:1,6-8): “ GOD standeth in the congregation of the mighty; he judgeth among the gods. I have said, Ye are gods; and all of you are children of the most High. But ye shall die like men, and fall like one of the princes.” Jesus elaborated a bit in explaining David, but of course that’s O.K. So according to Jesus Christ, those people who really have the word of God know they have the capacity to be gods because they are children of the Most High God. 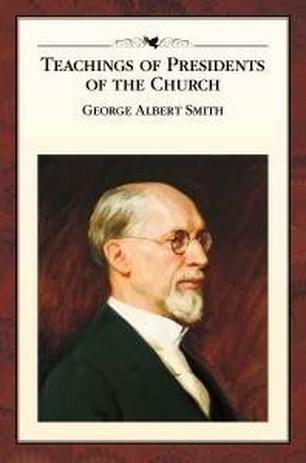 Conversely, anyone who does not know this principle ,has not yet received the word of God or it would be plainly manifest to them through the scriptures, which cannot be broken, which testify of this fact through the teachings of Jesus and David, as well as others, both ancient and modern (like the above quotes). Jesus took a lot of flak for pointing this out to the unbelievers (they beat him and killed him later on) and so do his saints. They are not the same translated words. Your exegesis is very poor. We are not destined to become God. But yet Mormons are taught that. As God now is, man may be."